This Featherlite 8 foot non-conductive fibreglass step ladder has a load capacity of 300lbs, rated Grade IA. 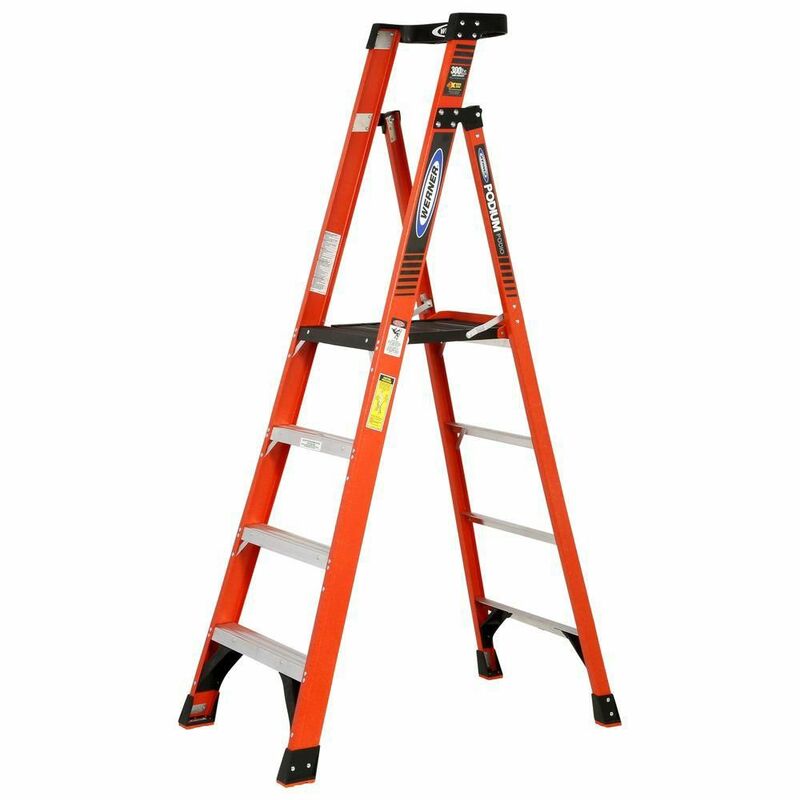 This ladder is equipped with the ProTop with multiple tool slots, heavy-duty gusset bracing, slip-resistant boot, inside spreader arms, wide back braces, and double-rivet step construction. The Featherlite FL-3010-08 stepladder meets or exceeds the safety standards set by ANSI, CSA, and OSHA. 10 feet Reach fibreglass Podium Ladder with 300 Lb. Load Capacity Grade IA is rated 4.7 out of 5 by 3. Rated 5 out of 5 by Farm Girl from Makes me stable and able! After using this ladder in our school gym equipment storage room, I just had to have one at home on my farm. I use a ladder quite often, in the house changing lights, and outside working on various things, from clearing eavestroughs to hanging Christmas lights and torching tent caterpillars up high in flowering trees. It is SO much safer and easier to do anything when standing comfortably on a platform, compared to balancing on a single ladder rung. I am always leaning as far as possible to avoid moving the ladder, and the curved support bar is perfect for that. I find the ladder lightweight and easy to move. Haven't had it very long, but pretty sure there will be no regrets. What is the hight of the platform. PDIA04CA height size to the platform is 4'. From the platform to the top is 3'. How high is the platform or podium off the floor? Thanks. The platform height of the PDIA04CA ladder is 4'.